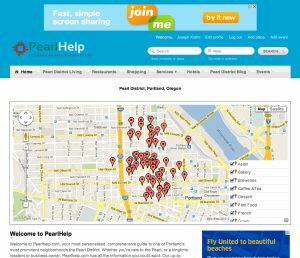 Welcome to the new and improved PearlHelp. We’ve been working hard the last few months to bring this fresh layout to life. Basically we had three key improvements in mind: better content, better navigation, and user registration. This new PearlHelp will serve as the best way, for visitors and residents of the Pearl District, to find a restaurant, store, or necessity. We hope you enjoy the new layout and use it for years to come. Content is king on the web. We could have the most beautiful website, but seriously lack content. So, the first step was to hire an additional content writer, we enlisted Andrew. He’s been an amazing benefit to the site – writing thorough descriptions of every business listing – and also collaborating on the rest of the project. Andrew is now a staff blog writer and will be contributing one blog post per week. During the construction we suspended blogging to focus our efforts on the new site. We expect to write two blog posts per week now. I took on the responsibility of creating more consistent navigation, as the lead developer. Each category page now displays a map of each listing in that category. You may also have noticed the homepage includes a map of all Pearl District restaurants. The listings are organized using the same categories, but improvements like tags and no duplicate listings have been made. Business owners can also claim their listings and make edits themselves (more on this below). We also incorporated ratings to business listings. Our viewers now have the ability to register an account. In order to review, comment, or add a place you must be logged into your account. Having an account is valuable especially for business owners, so they can claim a listing and makes edits anytime. We plan to invest more in the future with user accounts, with possibilities like a Pearl District Forums and Pearl District Classifieds. So register today! We enlisted the help from a local developer, Will Ashworth, and his consulting agency Ashworth Consulting. Ashworth is now powering PearlHelp using some of the most secure and advanced web server’s in Portland, and his assistance on the migration from our old server is greatly appreciated. Our content management system (CMS) works great for non-technical users, it’s called WordPress. Many are familiar with WordPress and its ease of use. Business owners may now feature their business on the homepage for a small price. Visit our FAQ center to learn more. We integrated an advanced search bar in the header. Images have been uploaded to all the applicable businesses (approximately 75%). The layout is responsive, which means it’s mobile friendly. We have updated all 350+ business listings, some were closed. A complete frequently asked questions center as been composed, however you may always contact us. Our logo has been redesigned to better represent the website new colors and the Pearl District. Everything has been developed with WordPress. This is great for staff so we can login remotely to work (previously we couldn’t login remotely). We hope you can enjoy this update as much as we are. If there’s any bugs, glitches, or design issues – don’t hesitate to contact us. We always love hearing from Pearl District enthusiasts like ourselves.